To mark the beginning of our Comenius project, Teresa O’ Malley from Midwest radio came to our school. She interviewed our teacher and the pupils from 3rd to 6th class. We were all very exited to hear ourselves on the news. You can listen to the recording below! Eight primary schools from Italy, Turkey, France, Ireland, Romania, Hungary, Estonia and Austria are about to embark on a Comenius project supported by the EU. 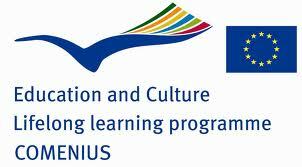 A Comenius project involves all member schools cooperating on common projects across various aspects of the curriculum. In early 2011 Gortskehy N.S. was invited by project coordinator Mr. Gerald Grahammer from Austria to take part in the EU Comenius School Partnership Programme. A Comenius project starts with a Preparatory Meeting which was held at Scoala cu clasele I-VIII “Sava Popovici Barcianu” at Răşinari in Transylvania, Romania. Partners met to discuss the basics of their planned project: title, themes, activities, the situation at their schools, motivation, equipment etc. The hospitality of our Romanian hosts was warm and welcoming with the headmistress Mrs. Carmen Olteanu and her Comenius team taking great care of everything we needed. The title of our project is “Follow our Footprints” (through school and everyday life, through nature, through our fairy-tales and legends, through local history, through our songs, dances and arts). The partnership aims to create an educational adventure with some European touch which will be an excellent opportunity for the children to learn about other countries and cultures.